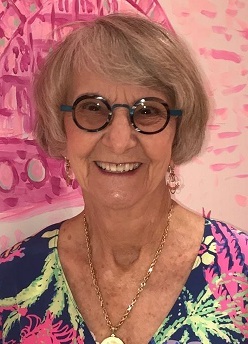 Clara H. Setzer 88 of St. Petersburg passed away February 12, 2019. She was born November 10, 1930 in Martinsville, Virginia, to Arthur Edward and Annie Elizabeth (Franklin) Hutcherson. She married Thomas B. Setzer on January 13, 1952. She is preceded in death by her husband of 42 years, Thomas B. Setzer; brother, Selera “Red” Hutcherson; brother, Charles Hutcherson; and a special friend, Kenneth E. Noonan. Surviving are her daughter, Nancyann and husband Mike Barr of Franklin, TN; daughter, Rebecca and dedicated partner, Lee Hussey of Martinsville, VA; granddaughter, Nicolette Hussey of Roanoke, VA; granddaughter, Megan Barr of Fort Myers, FL; and her sister, Ida Crowder of Danville, VA.
Clara was full of life and energy in her 88 years, many referenced her as a “spitfire” because she was always on the go. She always took the stairs no matter what. She was so talented and humble, her passion for painting and creating art brought her so much joy. You could always find her dancing any chance she got! We hope to honor her vivacious life with a proper celebration of life. Services will be held at 2 p.m. Friday, February 15, 2019 at Calvary Catholic Cemetery in Clearwater with the Rev. Mary Moore officiating.